This Desktop Tutorial is for people who are new to programming and new to Xojo. It is an introduction to the Xojo desktop development environment and will lead you through the development of a real desktop app. It should take you about an hour to complete this tutorial. If you would like a shorter introduction to Xojo for desktop, take a look at the Desktop QuickStart. If you have experience with other programming languages, you’ll also want to check out the User Guide and Language Reference. 5.1 What is a Property? If you haven’t done so already, now is the time to start Xojo. After it finishes loading, the Project Chooser window appears. Xojo lets you build several different types of apps (Desktop, Web, Console and iOS). For this Tutorial, you are building a desktop app, so click on Desktop. You should now see three fields that need values: Application Name, Company Name and Application Identifier. Application Name is the name of your app. This will be the filename of the actual app file that gets created. Company Name is the name of your company. You may choose to leave this blank. Application Identifier is a unique identifier for this app. It will automatically populate using what you enter for the Application and Company Names, but you can also change it to whatever you want. 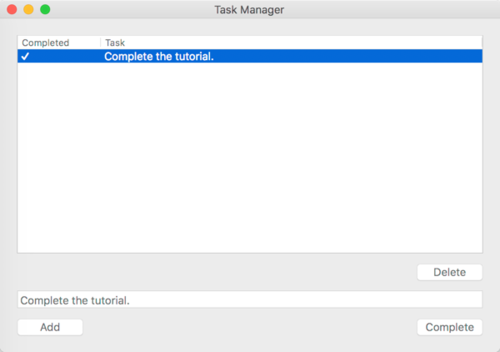 Enter "TaskManager" as the Application Name. You can leave Company Name as it is or change it. Click OK to open the main Xojo window (called the Workspace), where you will begin designing your app. Xojo opens the Workspace with the default window for your app selected in the Navigator and displayed in the Layout Editor. Navigator: The area on the top left shows you all the items in your project. By default you can see Window1 (which is selected), the App object and the MainMenuBar object. You use the Navigator to navigate within your project. Layout Editor: The center area is the Layout Editor. You use the Layout Editor to design the user interface for the windows in your app. It shows the window and previews how it looks when the app runs. In this image, the window is blank because you haven't yet added any user interface controls from the Library. Library: The area on the right is the Library and shows the controls and interface elements that you can add to a window or to the project. You design the window by dragging controls from the Library to the window. You can also add a control to the window by double-clicking it. You can change how the controls display in the Library by clicking the small gear icon ￼ and choosing a different setting. If the Library is not visible, click the Library button on the toolbar to show it. Inspector: Not shown in the above image is the Inspector, which allows you to see and change the properties for the selected control. This area of the Workspace window is shared with the Library. You can show the Inspector by clicking the Inspector button on the toolbar. The Inspector shows information about the selected item in the Navigator or Editor. The contents of the Inspector changes as you click on different items. You change an Inspector value by entering a new value in the field to the right of the field label. 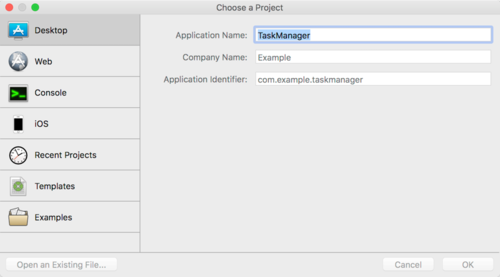 In this tutorial you will create an app to manage tasks. Not surprisingly it is called Task Manager. For the Task manager app, you enter tasks in the text field and click Add to add them to the list. You can click on individual tasks in the list to delete them or mark them as complete. List Box: A control that is a scrollable list. It can show both single and multiple-column lists and scroll horizontally and vertically. Text Field: A control for entering a single line of text. Button: A standard button. It is most often used to initiate an action. In the next sections, you'll create this app step-by-step. 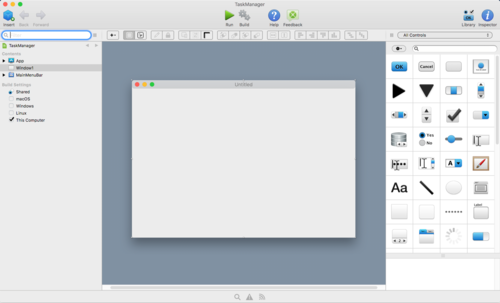 You should have Xojo running and Window1 open in the Layout Editor. You are now going to add a Listbox to the window. The Listbox is used for storing the tasks. Add the Listbox: In the Control Library, click on the Listbox and drag it to the top-left corner of the Layout Editor. As you get close to the edges of the window, you will see alignment indicators that help you position the control. Drop the Listbox when you are happy with its position. Resize the Listbox: Click on the Listbox so that the resizing handles appear. Grab the handle in the bottom-right corner and drag it to enlarge the Listbox to fill the top 2/3 of the window. Now you will add the three buttons needed by Task Manager to the window. The Delete button removes tasks from the Listbox, the Add button adds tasks to the Listbox and the Complete button marks tasks in the Listbox as completed. Add the Add Button: In the Library, click on the Generic Button control and drag it to the window near the bottom-left corner. Again, take advantage of the alignment indicators to help you position the button. Add the Complete Button: In the Library, click on the Generic Button control and drag it to the window near the bottom-right corner. The Text Field is where the user types the Task to add to the list. In the Library, click on TextField and drag it to the window so that it is between the delete and add buttons. Resize the Task field. Select the rightmost drag handle and drag the TextField so that it is the same width as the Listbox. Use the alignment indicators as guides to help you line everything up correctly. Rename all controls (and the window) so that they describe their behavior and are easy to refer to in code. Add Captions to the Buttons. Set Locking properties so that the controls resize properly when the window is resized. The Inspector is used to change view and control properties. It shares the same area on the right of the Workspace as the Library. In order to show the Inspector, click the Inspector button on the toolbar or press ⌘-I (Ctrl+I on Windows and Linux). First, in the Layout Editor, click on the title bar of the window to select it. The Inspector now shows the properties for the window. In the Name field (located in the ID group), change the name from “Window1” to “TaskManagerWindow”. Press Return to see the name change in the Navigator. In the Title field (located in the Frame group), change the name from “Untitled” to “Task Manager”. Press Return to see the name change in the title bar of the window. The Listbox is where the tasks that your user enters are displayed and stored. You need to change the following properties: Name, HasHeading, ColumnCount, InitialValue, ColumnWidths and Locking. First, in the Layout Editor, click on the Listbox to select it. The Inspector now shows the properties for Listbox. In the Name field (located in the ID group), change the name from “Listbox1” to “TaskList”. Press Return to see the name change in the Navigator. The Listbox will have a heading. Find the HasHeading property and change the value from OFF to ON. The Listbox has two columns, one to show the completed status and another to show the name of the task. In the ColumnCount field, change the value from “1” to “2”. Press Return to see the Listbox appear with two columns layout. You want to change the column headers to describe the data in the list. Find the InitialValue property and click the "pencil" icon to its right. This opens a small editor window where you can enter the column heading values. Type "Completed", press the Tab key, and then type "Task". Click the OK button. You'll see the column headings for the ListBox change. Since Completed is only going to contain a simple checkmark when the task is marked as completed, it can be narrower. In the ColumnWidths field, enter the value of “100,*”. Press Return to see the column widths change. Using “100,*” tells the Listbox that the first column should always be 100 pixels wide and that the rest of the columns share the available width. Lastly you need to make changes to the locking so that the Listbox gets larger or smaller as the window size changes. In the Locking group look at the image that shows the window with small locked icons for the top and left and small unlocked icons for bottom and right. Click the locks so that top, left, bottom and right are all locked. The three buttons are used to perform actions. You need to change the following properties for each button: Name, Caption and Locking. The Delete button is used to remove tasks from the TaskList. First, in the Layout Editor, click on the Delete button to select it (this is the button directly below the Listbox). The Inspector now shows the properties for PushButton. In the Name field (located in the ID group), change the name from “PushButton1” to “DeleteButton”. Press Return to see the name change in the Navigator. In the Caption field (located in the Appearance group), change the name from “Button” to “Delete”. Press Return to see the name change on the button in the window. Now you need to make changes to the locking so that the Delete button stays on the right side of the window when the window resizes. In the Locking group look at the image that shows the window with small locked icons for the top and left and small unlocked icons for bottom and right. Click the locks so that right and bottom are locked and left and top are unlocked. The Add button is used to add the task entered in the TextField to the Task List. In the Layout Editor, click on the Add button to select it (this is the button on the far left of the window below the TextField). The Inspector now shows the properties for PushButton. In the Name field (located in the ID group), change the name from “PushButton2” to “AddButton”. Press Return to see the name change in the Navigator. In the Caption field (located in the Appearance group), change the name from “Button” to “Add”. Press Return to see the name change on the button in the window. Now you need to change the locking so that the Add button stays on the bottom of the window when the window resizes. In the Locking group look at the image that shows the window with small locked icons for the top and left and small unlocked icons for bottom and right. Click the locks so that left and bottom are locked and top and right are unlocked. The Complete button is used to mark a task as completed. In the Layout Editor, click on the Complete button to select it (this is the button directly below the TextField on the right). The Inspector now shows the properties for PushButton. In the Name field (located in the ID group), change the name from “PushButton3” to “CompleteButton”. Press Return to see the name change in the Navigator. In the Caption field (located in the Appearance group), change the name from “Button” to “Complete”. Press Return to see the name change on the button in the window. Now you need to make changes to the locking so that the Complete button stays on the right side of the window when the window resizes. In the Locking group look at the image that shows the window with small locked icons for the top and left and small unlocked icons for bottom and right. Click the locks so that right and bottom are locked and left and top are unlocked. In the Project List, the newly renamed controls show under the Controls for TaskManagerPage. The TextField is where your user will type the task to add to the list. You need to change the following properties: Name and Locking. In the Layout Editor, click on the TextField to select it. The Inspector now shows the properties for TextField. In the Name field (located in the ID group), change the name from “TextField1” to “TaskField”. Press Return to see the name change in the Navigator. Now you need to make changes to the locking so that the TextField gets larger or smaller when the window resizes. In the Locking group look at the image that shows the window with small locked icons for the top and left and small unlocked icons for bottom and right. Click the locks so that left, bottom and right are locked and top is unlocked. Your user interface layout is now complete, so it’s time to try it out. But before you go further, you should first save your work. Save the project by choosing File ↠ Save. Name the project “TutorialDesktop” and click Save. Click the Run button in the toolbar to run the project. 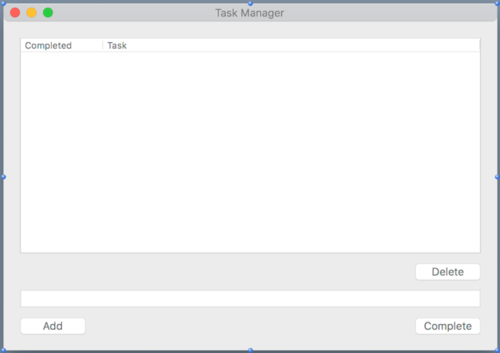 When Task Manager is displayed, you can interact with the buttons by clicking on them, you can type in the TextField and you can resize the window to see the buttons reposition themselves. Select Quit from the app's menu to return to the Layout Editor. Of course, Task Manager doesn’t do anything yet! For that you need to add some code, which is what you'll do next. The Add button adds tasks to the list. The code you add to the button needs to take what was typed in TaskField and add it as a new row to the list. On the window, double-click the AddButton control, labelled “Add”. The Add Event Handler window appears. When a user clicks on a PushButton, the Action event handler is called. This means you want to add your code to the Action event handler, so select Action from the Event Handler list and click OK. This displays the Code Editor. Also notice the Navigator updates to show the Action event underneath the AddButton control. Run the app to test it out. Type tasks in the task field and click the Add button to see them appear in the task list. Close the browser tab or window to return to the Code Editor. When the user clicks the Complete button, the selected task in the Listbox should be marked as completed. This is indicated by showing a checkmark (✓) in the Completed column. On the window, double-click the CompleteButton control, labelled “Complete”. The Add Event Handler window appears. When a user clicks on a Button, its Action event handler is called. This means you want to add your code to the Action event handler, so select Action from the Event Handler list and click OK. Notice the Navigator updates to show the Action event underneath the CompleteButton control and the code editor displays. To change a row, you first need to know what row is selected. In a Listbox, the currently selected row is contained in the ListIndex property. Run the app and add a few sample tasks. Now click on a task and click the Complete button. A checkmark appears in the Completed column. Select Quit from the menu to return to the Code Editor. The Delete button is used to remove tasks from the list. The code you add to the button needs to determine the selected row in the list and remove it from the list. On the window, double-click the DeleteButton control, labelled “Delete”. The Add Event Handler window appears. As you learned with the other buttons, you want to use the Action event handler to have your code run when the user clicks on a button. Select Action from the Event Handler list and click OK. Notice the Navigator updates to show the Action event underneath the DeleteButton control and the code editor displays. Since the selected row will be deleted, you again want to use the ListIndex property. Run the app and add a few sample tasks. Now click on a task in the Task List and click the Delete button. The task is removed from the list. Finding Bugs is part of creating apps. A bug is when your code or app does something unexpected, often leading to a crash. Although your app works just fine, there are a couple of lingering bugs that need addressing. Have you figured out what the problem is? Here’s a hint: What happens if you you click on the Complete or Delete buttons but have not selected a task? Try it. Run the app and click on the Complete button without doing anything else. Your app will switch to the Debugger with a line of code highlighted. Your code generated an OutOfBoundsException and you are now in the debugger. The error occurred because you attempted to remove (or complete) a row that does not exist. When no row is selected in the Listbox, the ListIndex property returns -1. Since this is not a valid row in the Listbox, the Cell method raises an OutOfBoundsException. Click the Resume button in the debugger toolbar, to see the actual error message. Click the button in the dialog to quit the app to return to the Editor. Nobody wants buggy code. Luckily it is easy to prevent this bug from occurring. Essentially, you want to make sure a row is selected before you attempt to Delete or Complete a task. In both cases, the code verifies that a row is selected by checking the ListIndex property to ensure that it contains a valid row before the actual method is called. Run the project again and click the Complete button without selecting a row in the task list. No more crash! Just because your app seems to work, doesn’t mean you are finished with it. A good developer always thoroughly tests their apps to look for possible problems. You already found and fixed one problem (clicking Delete when no row was selected). Do you think there are other problems to fix? Run the app and play around with it a bit. Make a note of things you want to change. In the next section, you will add some improvements to Task Manager. Did you notice that there are times when the buttons in Task Manager probably should not do their action? For example, the Complete button should not try to mark a task as completed if one is not selected. Right now you can click it, but nothing happens. Also, you are not going to want to add a task to the list if nothing has been entered in the task field. There are several ways to accomplish this, but one way is to disable the buttons when they should not be used. 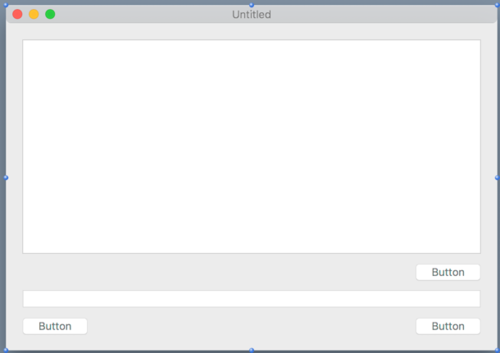 On the window, select CompleteButton, labeled “Complete”. In the Inspector, turn the Enabled property (in the Appearance group) to Off. Select AddButton, labeled “Add”. In the Inspector, turn the Enabled property (in the Appearance group) to Off. Select DeleteButton, labeled “Delete”. In the Inspector, turn the Enabled property (in the Appearance group) to Off. Now you will add code to enable the Add button when there is text in the Task Field. On the window, double-click the TaskField control. The Add Event Handler window appears. Here you are seeing yet another list of event handlers. Every control type has its own specific list of event handlers. In this case, we want to disable AddButton when there is no text in the task field and enable it when there is text. The TextChange event is called whenever the text in the task field is changed, either by the user typing or by your code changing the Text property. Select TextChange from the Event Handler list and click OK. Notice the Navigator on the left updates to show the TextChange event underneath the TaskField control and the code editor displays. You already added code earlier to prevent the Delete and Complete buttons from doing anything if no row is selected in the Task List. Now you can also make those buttons enable when a row is selected and disable when no rows are selected. This is accomplished with the ListIndex property of the Listbox. Double-click the TaskList control. The Add Event Handler window appears. Here you are seeing the list of event handlers for ListBox. The Changed event is called whenever the selection in the TaskList control changes. Select Changed from the Event Handler list and click OK.
Run the app to test it out. Notice that the Add button is initially disabled. But try typing some text in the Task field. The Add button immediately become enabled. And if you remove the text from the Task field, the buttons again become disabled. Similarly, when you click on a row in the Task List, the Delete and Complete buttons become enabled. Now that you have created this fine app, you probably want to share it with the world. To do so, you need to build a standalone app. Xojo lets you create desktop apps for MacOS, Windows, and Linux (including the Raspberry Pi). The first thing you want to do is to decide which platforms you wish to build. You do this using the BUILD section of the Navigator. First, check the box next to the platforms you want to build. By default, “This Computer” is checked so that you will at least create a build for the platform you are currently using. To see settings specific to each platform, click on the platform name. The Shared Build Settings contain the version information and other settings. You can click around on these various build settings to look at them, but you do not need to change any in order to build this app. To build the app, click the Build button in the toolbar (or choose Project ↠ Build Application from the menu). Xojo creates a standalone app for each selected platform. In the folder containing your project, you will see a folder called “Builds - TaskManager.xojo_binary_project” and inside this folder will be folders for the builds for each platform. Navigate to the build folder for your current platform and double-click the app file to run it. Congratulations, you have successfully completed the Desktop Tutorial and now have a fully functional app. To continue on your journey of learning Xojo, you should next move on to the User Guide, which covers Xojo in its entirety. You will also want to refer to the Language Reference, which covers the specifics of language elements, classes and other details of Xojo. This page was last edited on 19 March 2019, at 18:40.